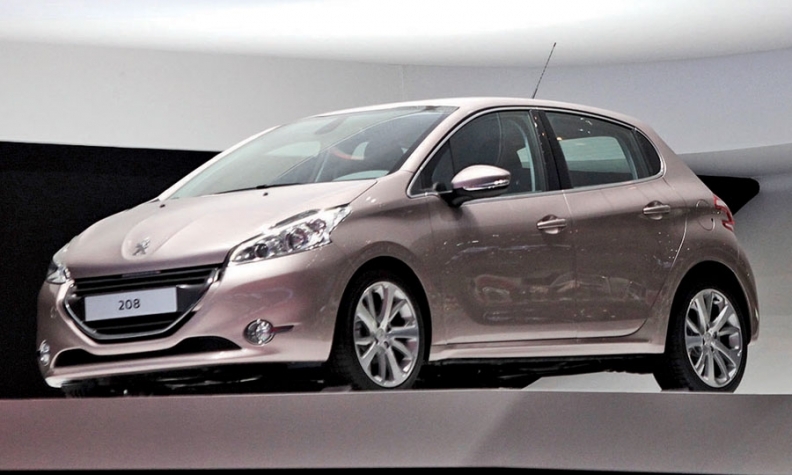 The Peugeot 208 replaces the 207, Europe's one-time top selling car. European vehicle sales continued to fall last month as buyers stayed out of showrooms during the region's economic crisis. Sales in the EU and EFTA countries fell 8.2 percent to 970,271, according to market researchers JATO Dynamics. Among Europe's five-biggest markets, only the UK saw new-car volumes rise, up 9.3 percent. Sales in Germany, the region's largest car market, were down 5 percent. French sales fell 7 percent, while Italian car sales declined nearly 22 percent. Spain, the No. 5 market, was down 26 percent. The Peugeot 208 last month joined the list of Europe's best-selling cars at No. 5, with sales of 17,986. The 208 subcompact went on sale in Europe in June as the successor to the 207, which was the best-selling European car in 2007. "The Peugeot 208's sales demonstrate once again how a new product can drive demand," said Gareth Hession, JATO's head of research, in a statement. He added that the performance of the Nissan Qashqai also demonstrated that a product with the right blend of form and function, and with the right marketing and technical improvements, can maintain strong sales well into its life cycle. All of Europe's top 10 sellers had volume declines last month, but the Qashqai's was the lowest at 6.3 percent (see chart below).